Are Volume-Limiting Headphones Safe for Your Child? What Are the Most Important Features You Should Be Looking for When Buying Volume-Limiting Headphones? Which Are the Safest Volume-Limiting Headphones? Almost every child today has a phone, tablet or uses his/her parent’s computer occasionally. You may consider it positive or not but the facts are facts and we all have to accept them and deal with them. As children start using these devices at an early age (even at the age of 3 or 4), many parents are trying to ensure at least some basic protection for their children’s ears. Luckily, many companies have started producing special volume-limiting headphones that are supposed to be safe for children. We say “supposed to be safe” because we are not confident about them and in this article, we will discuss it and explain our opinion. Volume-limiting headphones are headphones specially made to enable listening to music in a “safe” mode. Their loudness is limited and you shouldn’t be able to bypass the limitation. 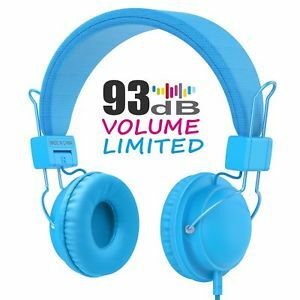 The most common limitation (at least advertised limitation) is 85dB. This specific loudness has been chosen because the World Health Organization claims this is the safe loudness. According to WHO, prolonged listening to audio content at volumes louder than 85 dB brings great risk of hearing damage. Actually, human ears aren’t made to listen to sounds louder than 70 dB without any consequences. However, we live in a time when noise is everywhere around us and you can’t completely protect your kids from it. There is just no way to avoid hearing car engines, motorcycles, concerts, etc. As you can see, the problem is not caused only by the headphones and loud music. Many other factors are there every single day and we really can’t do much to improve the situation except to isolate ourselves from noisy cities. The problem with 70 dB music is that it loses its clarity and the low parts become even quieter and quite hard to understand. When a song is not distinctive and you can’t really understand what’s the song about, you lose the enthusiasm to listen to it. This is why many manufacturers decided to limit the loudness to 85 dB because the clarity of music is not important only to us but also to our kids no matter how young they are. Some volume-limiting headphones have special buttons that turn on/off volume-limitation. Others don’t have these on/off switches and you can’t simply bypass the limitation. If the headphones are going to be used only by your kids, it would be a good idea to buy a model without these extra buttons. Although the idea sounds amazing and calming for parents, volume-limiting headphones are not so perfect and they should be used carefully. Here are some of the most common problems you may encounter when using volume-limiting headphones. According to one research, many volume-limiting headphones that are supposed to limit the loudness to 85 dB are more or less loud than they are supposed to be. The researchers gathered 50 models of volume-limiting headphones made by different manufacturers. They were inspecting the loudness of the headphones by playing music and pink noise and they discovered that half of the headphones didn’t meet the requirements. We can’t really say that most of those headphones were much louder than 85dB. Some of them had the sensitivity of 88 or 90dB. Of course, there were the models that were even louder, which practically led us to the conclusion that the manufacturers don’t really bother about your children’s health but only about their profit. They are constantly trying to attract customer attention by making nice and shiny advertisements while their products don’t meet the volume-limiting standards. As we have previously mentioned, some of the volume-limiting headphones are 2-in-1 headphones. They usually have the button that turns the “safe” mode on or off. If you remember how children like pressing any buttons they see, you will realize how dangerous it can be to use this kind of headphones. Also, the loudness of wired headphones depends on the power source. Most of the volume-limiting headphones are made to work with smartphones that are not too powerful: however, you can also use them with more powerful sources like computers, home theater systems or gaming systems, which automatically increases the loudness of your headphones. If your child uses a smartphone on a regular basis, there is no reason for him/her not to plug the headphones in some more powerful device in the house. When we speak about good volume-limiting headphones, we don’t speak only about the actual volume limitation. There are many other characteristics that should be considered because they make the headphones better and improve the safety of your child. Headphones without volume-limitation bypass switch are the better option. If you have decided to buy this kind of headphones, you should consider buying the headphones that don’t work in two modes. You won’t be able to turn the volume limitation off and use them as regular headphones but it is safer for your child because your child can’t do it either. Remember how people always say that Bluetooth headphones can never be as loud as wired? Well, in this case, it’s the advantage. The loudness of Bluetooth headphones is defined by the power of the built-in amplifier and it can’t be increased. The loudness of wired headphones depends on the device that is the source of music and the source of power. Also, it sometimes happens that the volume-limiting mode doesn’t work if you don’t plug the cables in the right way. You won’t have these problems with Bluetooth headphones. You can’t change their settings and once you reach the maximum volume, you can’t do anything to make them louder than they are. Whenever you’re buying something for your child, you’re paying more attention to some details you wouldn’t normally pay attention to. When buying headphones that your child will wear for at least few hours a day, you should make sure they are as light and as comfortable as possible. Their heads are young and they are still developing. This is why it is so important that the headphones don’t have big clamping force and that they aren’t too heavy. Apart from comfort, you should think about durability. It is important because kids break things easily, either because they are inspecting them or they simply don’t know how to treat them. The headphones that are made from metal or aluminum are better than plastic ones because they are more difficult to break. We can’t answer this question with one word because the effect of volume-limiting headphones depends on many other factors. One of the most important factors is the time your child spends with headphones. Using headphones even at 60 % volume (which is approximately 85 dB) or less can have negative consequences if you’re using them for too many hours every day. Listening to loud music is not the only reason for hearing loss. Just like hair loss, hearing loss can be caused by our genetics and this is something we can’t really avoid. However, you can start taking care of your child’s hearing from the very beginning and teach the child to do the same things later when he/she becomes independent. One of the things you can do is to control the time your child spends using headphones. You can also check the loudness by coming closer to your child while he/she is listening to music. If you can hear the music through the headphones, you should warn your child to lower the volume. The other way is to stand at arm’s length distance from your child and ask a question. If your child can’t hear you, it means the music is too loud and the volume should be lowered. The other way to control the loudness of the music is to adjust the settings on his/her phone. It gets much easier with iPhones because you can set the loudness simply by accessing music settings. Once you access it, you can set the maximum volume limit and even protect the settings with the password. If you have an Android phone, it can be difficult but you can try to download some of the apps and control the volume through them. In the end, we would like to recommend some of the volume-limiting headphones that meet volume-limiting standards and all the previously mentioned criteria. Some of them are wireless while the others are wired but all of them are easy to use, very durable and comfortable. The researches showed that some of the best volume-limiting headphones are: Puro Sound Labs BT2200 Bluetooth headphones, Onanoff BuddyPhones Explore, JLab JBuddies Studio or Puro JuniorJams. What Are Stereo Amplifiers and How Do They Work?